“CS547. 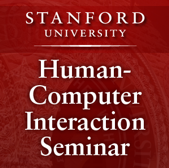 Human-Computer Interaction Seminar (Seminar on People, Computers, and Design)” is a course of the Stanford HCI Group, coordinated by Terry Winograd, on topics related to human-computer interaction design. Archived lectures from CS547 can also be downloaded from iTunes.